Sony Xperia Z Ultra is an android smartphone that made an entry in the market back in 2013, July. The phone comes with a protection of shatter proof glass technology. If you want to connect your device to a computer or flashing firmware on your device, then you need to download the drivers for your device. Here, you will find the required drivers for your device. 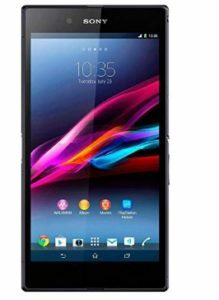 Sony Xperia Z Ultra has an awesome display with a large size of 6.4 inches supporting resolution of 1080×1920 pixels covered by shatter proof glass technology. The type of display is IPS LCD capacitive touchscreen, 16M colors. The version of software installed on it is Android 4.2 (Jelly Bean) and it can also be upgraded to Android 5.1 (Lollipop). For better performance, it include quad-core 2.2 GHz Snapdragon 800 processor with Li-Ion 3050 mAh battery. It include 16 GB of internal memory with 2 GB RAM and also support micro-SD card upto 64 GB. The connectivity medium of the phone include WLAN, Bluetooth, GPS, NFC, Radio and USB. For photos and video, the phone offers 8MP Primary camera including features and 2MP secondary camera. The sensor on the phone include Proximity, Accelerometer, gyro and compass. The price of Sony Xperia Z Ultra in India starts from 20,000.